PayPal is a useful tool for making payments. Originally designed for online payments and purchases, PayPal also allows you to shop at brick-and-mortar retailers using your PayPal account instead of traditional payment methods. You can fund payments from several sources, including your debit card. If you prefer shopping with a debit card, it might even be wise to run payments through PayPal. Doing so protects your card information: Instead of swiping your card at retailers or punching in your card number everywhere you shop online, PayPal creates a layer between your checking account and the merchants you shop with. In a world of hackers and constant data breaches, it’s nice to insulate your checking account from trouble. That protection gives you more confidence when buying from online vendors that you don’t know anything about, and even household-name retailers get hacked periodically. This article is about using a debit card to fund purchases you make through PayPal. If you want to get a new debit card issued by PayPal (which might let you spend from your PayPal balance), skip to PayPal debit and credit card options. If you’re just planning to use your debit card as your “funding method” at PayPal, you might be adding unnecessary steps. PayPal wants to link to your bank account anyway—and that’s the same account that your debit card pulls from. As a result, you don’t need to add your debit card. In fact, some PayPal transactions are cheaper if you use your bank account for funding (as opposed to using your debit card). To use your debit card on PayPal, you’ll need to add it to your Profile. To do so, log into your account and go to your “Wallet.” Next, find the section to “Link a card or bank.” You can also add cards while a payment is in progress by selecting “New Card” while you choose how to pay. Select the type of card you’re using, and provide the card information. Entering debit card information is the same as entering credit card information: The format for card numbers and expiration dates is the same. Types of cards: You’ll get the most functionality if you use a real debit card issued by a bank or credit union. Those cards feature a billing address that matches your home or mailing address, and they have a three or four-digit security code on the back. Prepaid cards: For one-time purchases, some Visa, MasterCard, Discover, or American Express prepaid gift cards will work. Other prepaid debit cards that you use as a substitute for checking accounts often do not work. Limits on linking: You can only link a debit card to one PayPal account. If you and your partner use cards with the same card number, which is common for credit cards, but less common for debit cards, only one of you can use that card with your PayPal account. Funding source: When you pay for goods or services, verify that you’re using the funding method that you want. To do so, look carefully at “How to pay” or the final review screen. You may have several options, including paying with your debit card, paying directly from a bank account, using a credit card, or spending from your PayPal balance. Since your debit card pulls funds from your checking account, you’ll need to have money available in your account to successfully make a purchase. If you’re low on funds, remember that any purchase will instantly reduce your checking account balance, increasing the odds that you’ll bounce checks or be unable to make other payments from that account. Transfers to your bank: You can’t move your PayPal balance to your debit card, but transferring the money to your bank account accomplishes the same thing. Your debit card draws money from your checking account, so funds in that account are available for spending with your debit card. To move money to your bank, look for several opportunities to “Transfer” money throughout PayPal websites and apps. Select the option to transfer funds to your bank. Refunds: If you fund a payment with your debit card and get a refund (because you return an item, for example), the refund should be applied to your debit card. If that doesn’t happen, the refund will go into your PayPal balance. From there, you can either spend that money elsewhere using PayPal or transfer the funds to your bank account manually. If you like debit cards because they’re inexpensive, make sure you don’t pay unnecessary fees to PayPal. For purchases from businesses—including individual sellers on eBay—PayPal doesn’t charge fees to the buyer. If you’re the customer, it doesn’t matter how you pay, but the merchant has to pay fees, and those charges might lead to higher prices. If you make personal payments (repaying friends for pizza night, for example), PayPal charges you a fee for using your debit or credit card. But funding the payment with your bank account is free. Again, with a debit card, the money comes from your checking account anyway, so you might as well fund personal payments directly from your bank account. 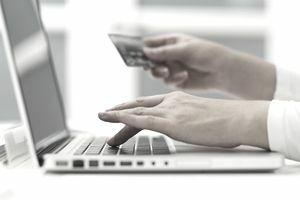 Is it Safe to Use a Debit Card With PayPal? Mistakes and fraud: Your debit card is linked directly to your checking account. Any charges to the card pull money out of checking more or less immediately. In cases of fraud or errors in your account, you might be protected, but it could be hard to pay bills until the funds are returned to your account. A credit card would be safer to use than a debit card—assuming you don't rack up debt—because credit cards do not pull funds from checking. Purchases and privacy: Paying with your debit card through PayPal is safer than just using your debit card. Merchants (as well as hackers, thieves, and employees) only see your email address—your PayPal username—and some personal information when you use PayPal. If you use a card directly, they would have access to your card number, security codes, and your mailing address. It's hard for thieves to use your PayPal account fraudulently without your password. Buyer protection: Credit cards have robust buyer protection under federal law. Most debit cards offer similar protection. However, PayPal offers buyer protection and other features that might go above and beyond what your debit card offers.